a A '?' denotes that no useful value for the quantity has been obtained, and 0' indicates an (unknown) extremely small value. 'For the giants the equatorial radius is to the atmospheric altitude where the pressure is 1 bar (105Pa). cFor Jupiter and Saturn the rotation period is for the deep interior (Section 11.1.3). 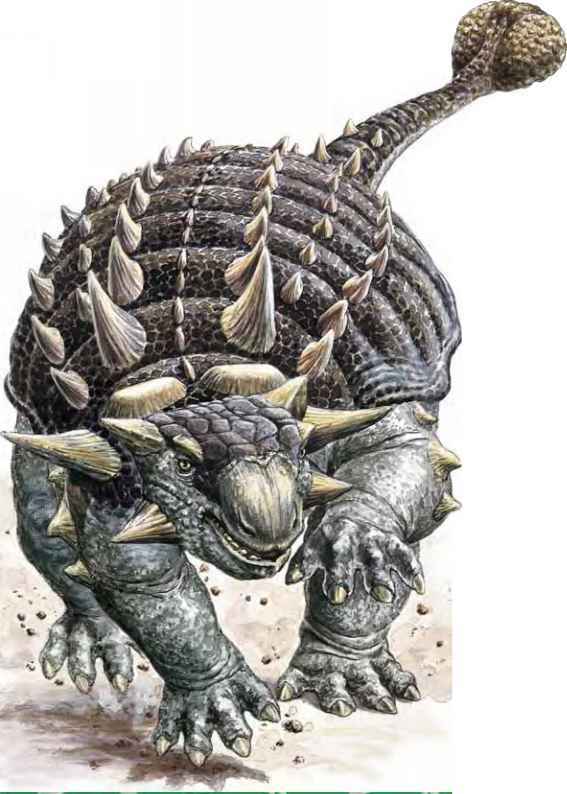 ""For the giants J2, J4, and J6 are used in preference to C/MRl to constrain radial variations of density. "To convert to Tm3 divide these values by 107.
f This assumes that Venus has much the same energy outflow as the Earth. 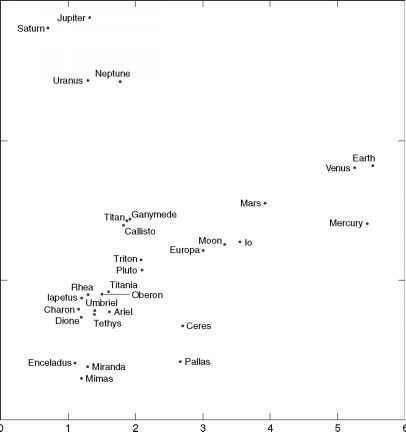 Figure 4.1 Radii and mean densities of Solar System bodies. The threshold radius is very roughly 300 km, and therefore among the bodies in Figure 4.1, Enceladus, Mimas, Miranda, and Pallas could be irregular. Use Figure 4.1 to argue that the giant planets divide into two subgroups on the basis of size and composition. You have seen that to obtain the mean density of a body we must first measure its mass. This measurement, however it is made, relies on the gravitational force that the body exerts on some other body. From more detailed measurement of this force we can go further, and obtain information on the variation of the density from point to point in the body. This equation underpins equation (4.2), and requires either that M and m are point masses or that they are spherically symmetrical, i.e. the density varies only with radius. In this latter case r is measured from the centres of the bodies, and we have to be outside them for the equation to apply. The direction of the force on m is towards the centre of M.
□ By measuring F and using equation (4.4) can we learn anything about how the density inside a spherically symmetrical body varies with radius? For a spherically symmetrical body we can learn nothing from external gravity measurements about the variation of density with radius - all possible variations of density with radius for a given total mass M would give the same external force. Fortunately, each Solar System body exerts a gravitational force that is not quite that given by equation (4.4), and therefore we can learn something about the variation of density with radius. and so g is independent of m. Like equation (4.4), equation (4.6) applies if M is a point mass or if it is spherically symmetrical. From Newton's second law, g is seen to be the acceleration of m.
Figure 4.2 (a) Specifying the position of a point P. (b) The variation of gravitational field with 0 at a fixed distance r from the centre of a planetary body with J2 = 0 and J2 > 0.
sufficiently small distances it is appreciable. The other extra terms decrease no less rapidly with r.
For most planetary bodies the main source of the J2 term is the rotation of the body. This flattens the sphere as in Figure 4.2(b), and it is the rotational flattening of the body that generates this extra term. 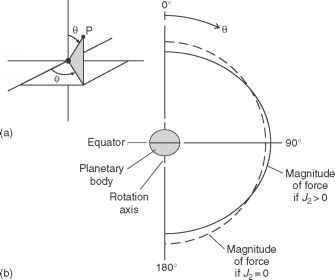 For a small degree of flattening the planetary body is an oblate spheroid (Figure 1.13(a)) - note that it is symmetrical around the rotation axis. The rotational flattening (also called the oblateness) is quantified by f = (Re - Rp)/Re, where Re is the equatorial radius and Rp is the polar radius. Figure 4.2(b) also shows how, at some fixed value of r, the magnitude of the total field g varies with direction when J2 is the only extra term. The field is symmetrical around 0 = 0 (the rotation axis) and it is a maximum at 0 = 90°. The larger the value of J2, the greater the variation of g with 0. With J2 > 0 the field now points towards the centre of the body only at 0 = 0, 90°, and 180° - this is not apparent in Figure 4.2(b) because magnitudes alone are shown, not directions. Regardless of its origin, the J2 term can be deduced from the gravitational field as mapped by small bodies in the vicinity of the planetary body, such as natural satellites and spacecraft. J2 provides a constraint on the variation of density with radius, in that only certain variations are consistent with the measured value of J2. However, a more powerful constraint is obtained if J2 is combined with other data to obtain a property of the body called its polar moment of inertia. This is a topic for the next section. 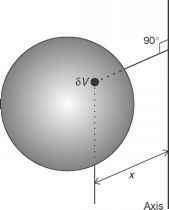 By considering a doubling in the distance r from a planetary body, show that the gravitational field becomes more closely like that of a spherically symmetrical body. A moment of inertia is a quantity involving a body and some axis. Any axis can be used, and the corresponding moment of inertia calculated. If we imagine the body divided up into small equal volumes SV, as in Figure 4.3, then the moment of inertia for the chosen axis is the sum of (pSV)x2 over the whole body, where x is the perpendicular distance from SV to the axis, and p is the density in the volume SV. (pSV is the mass SM in SV.) The moment of inertia therefore depends on the choice of axis. For a rotating planetary body the rotation axis is a natural choice, in which case we have the polar moment of inertia C. C depends on the variation of density from place to place in the body, which is why it is a powerful constraint. C can be obtained from the precession of the rotation axis (Section 1.5.1). Precession is caused by the gravitational torque on the non-spherical mass distribution of the rotating body. For the planets the torque is provided by any large satellites and by the Sun. In order to calculate C, the precession period has to be known, and also the mass M of the rotating body, its equatorial radius Re, its sidereal rotation period T, and J2. So far it has been possible to apply this precession method with useful accuracy only to the Earth, the Moon, and Mars. The details are beyond our scope - see books on celestial mechanics in Further Reading. To obtain C for the other planetary bodies we have to assume that the interiors are in hydrostatic equilibrium, i.e. that the interior has responded to rotation as if it had no shear strength - as if it were a fluid. Solid materials in planetary interiors can achieve such equilibrium in times very short compared with the age of the Solar System because of the huge internal pressures that overwhelm the shear strength of the solids. For a planetary body in hydrostatic equilibrium, the value of C can be calculated from M, Re, J2, and T - again the details will not concern us. If J2 is unknown, then the rotational flattening f can be used instead. In fact, J2 is preferred to f because any departures from hydrostatic equilibrium are likely to be confined to the outer layer of the body, which influences f more than J2. Furthermore, terms additional to the J2 term can reveal departures from hydrostatic equilibrium, and these can be used to adjust J2 so that C can be calculated more accurately. exactly); for a sphere with the same density throughout it is 0.4 exactly; and for a sphere with its mass concentrated entirely at its centre it is zero. The giant planets are so rotationally flattened that J2 is comparatively large, and further terms in equation (4.7) are then also significant. Their strength is measured by the gravitational coefficients J4 and J6 (odd-numbered terms like J3 and J5 are zero because of the northern-southern hemisphere symmetry of the giant planets). In this case J2, J4, and J6 are in themselves a useful constraint on radial variations of density, and for the giant planets are often used in preference to C.
Show that C/(MR2) = 1 exactly for a hollow, cylindrical tube, with a radius R and a mass M, for rotation around the axis running along its longitudinal axis. The measurement of the gravitational field near a body also enables us to obtain the Love numbers of the body, named after the British geophysicist Augustus E H Love (1863-1940). They are derived from the distortion of the surface and interior of a body caused by the tidal forces exerted by other bodies. These tidal distortions can be sensed by their effect on spacecraft orbits. For our purposes we need only note that their values give us a measure of how much the interior of a planetary body deforms under tidal stresses. From this, we can deduce, for example, to what extent the interior is liquid, liquids being much more deformable than solids. Very close to the surface of a planetary body the gravitational field is sensitive not only to radial variations of density, but also to local mass distributions. For the modelling of planetary interiors one of the most important things we can learn from such data is whether the planet is in isostatic equilibrium. A familiar example of isostatic equilibrium is a block of ice floating on water, as in Figure 4.4(a) and (b). The ice is less dense than the water and in equilibrium floats with its base at a certain depth such that in any vertical column above this depth, within the ice and beneath it there is the same amount of mass. This is where the term 'isostatic' comes from - 'equal standing'. If the ice is raised and released there is a net downward force on it, and if it is pushed down and released there is a net upward force on it. Because liquid water is very fluid the ice quickly regains its equilibrium level, and isostatic equilibrium is restored rapidly. The minimum depth above which there is equal mass in each column is called the depth of compensation. Imagine measuring the gravitational field at a fixed altitude above the water surface. If the ice is in isostatic equilibrium then the field changes very little over the block, because of the 'equal standing'. Thus, in spite of the mountain of ice, gravity hardly varies across it. By contrast, if there is no isostatic equilibrium the amount of mass in a vertical column changes as we cross the ice, and so the variations in the field are larger. By measuring the field as we cross the ice we can determine whether the ice is in isostatic equilibrium. □ How does the field vary if the ice is below its equilibrium level? If the ice is below its equilibrium level there is a deficit of mass in its vicinity and so the field is slightly weaker than to each side. If it is above its equilibrium level there is an excess of mass and the field is slightly stronger.